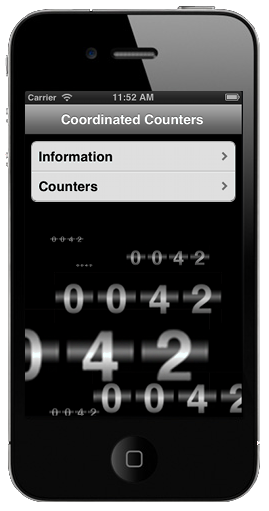 Coordinated Counters is a new iPhone app that allows any number of people to share a counter on their iPhones. When anyone updates the count it is immediately reflected on everyone's counter. You can create as many coordinated counters as you wish. 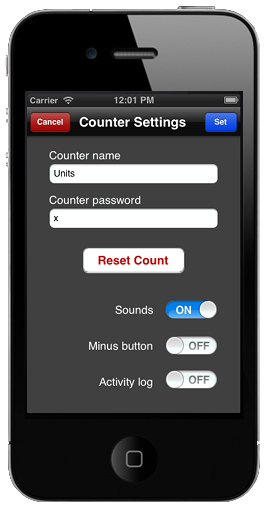 You allow others to connect to one of your counters by telling them the counter name and its password. If you're not connected to the network, updates you make to your counter are saved until you are again connected. Then your updates are applied as well as updates others may have made while you were off line. Tap on My Counters and then tap on Create a new counter. Enter a name for your counter and the password you and others will use to access the new counter. Click on the Create button. If the counter name you chose is already in use, a message to that effect will be displayed. We suggest that you prefix your counters with something that others are unlikely to duplicate, like your initials or company name. How many counters can I create? Swipe left on the counter name. A Delete button will appear. Tap on the Delete button to delete the counter. Your contribution to the counter total will be removed. When the last user of the counter deletes the counter, it is removed from the counter database. Until then, the counter name will remain in use. How do I share a counter? Tell the people with whom you want to share the counter the name of the counter and counter's password. They will tap on Connect to a counter in the Counters page, enter the counter name and password, and tap the Connect button. How do I change my counter's settings? Tap on the small colored dot (the counter's status indicator) at the bottom of the counter page. 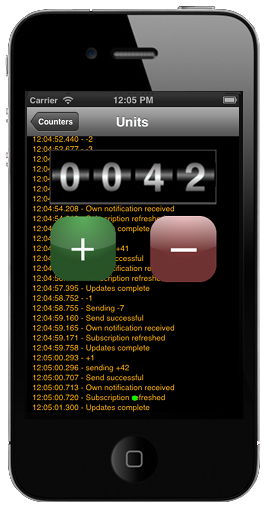 This will display the settings for the counter. 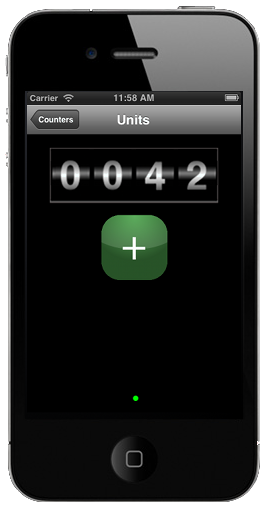 You can add a minus button, turn off the sounds, show a log of counter activity, or reset the counter to zero. What do the colors of the counter's status indicator signify? Red means off-line; disconnected from the Coordinated Counters server. Green means connected and all changes have been sent and acknowledged. Flashing orange means messages are being sent to the server. Orange means waiting for the server to acknowledge the messages we sent. Can I use my counters when I am disconnected from the Internet? Yes. 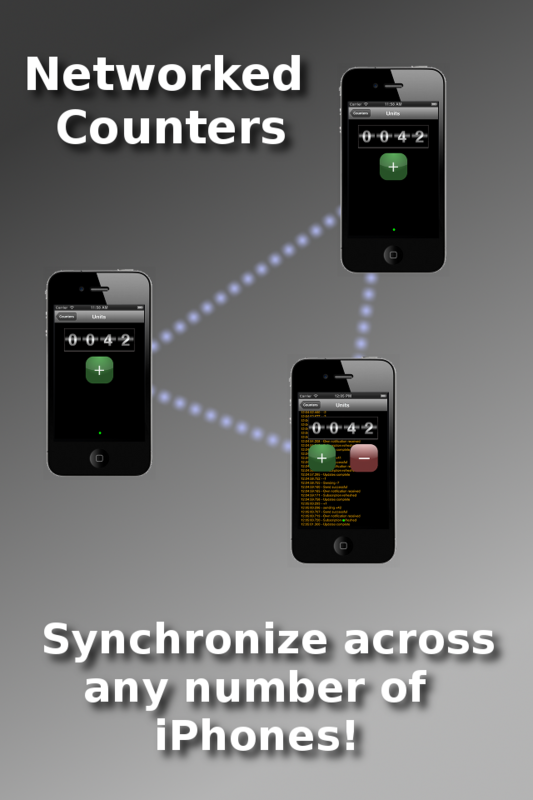 Your changes will be synchronized via the Coordinated Counters server with the others sharing the counters the next time you use the counter when you are connected. Will Coordinated Counters work over both WiFi and cellular connections?